Vetus new retractable thruster is designed to make the docking experience easier, faster and more enjoyable. Compact, lightweight and non-corrosive, the new thruster can be placed right in the bow, creating optimum leverage and generating more power. Because the thruster is not connected directly to the hull, there is also less annoying noise and vibration. Deployment and retracting times are fast and the retractable thruster’s robust, compact design means it requires very little space. This makes it ideal for both power and sail boats and for shallow draft vessels. It can even be positioned in the stern. Featuring Vetus’ patented swivel point design, the retractable thruster rotates as a single unit. The lid closes flush with the hull meaning there is minimal drag. As no light can reach the retracted thruster, there is virtually no marine growth. Combined with the thruster’s less intricate design, fewer moving parts and completely non-corrosive submerged parts, there is also less maintenance. The new Vetus retractable thruster is also incredibly safe and childproof. It comes with protection against accidental operation or lid overload; automatic retracting and switch off after 30 minutes; automatic retracting after switching off engine; a built-in time-lapse device when reversing the direction of rotation and unique intelligence to prevent jamming, overload and blocking. 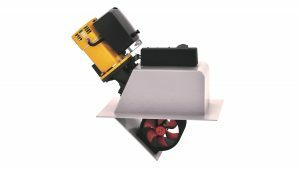 Suitable for all vessels up to 20 metres, the Vetus retractable thruster’s six models come with an optional control panel and are available nationwide through Lusty and Blundell’s network of leading marine dealers.